After you know how to approach a dominant 7th chord in a blues fashion on the guitar, you’re ready to tackle a whole chord progression. The most common type of blues chord progression is the so-called twelve-bar blues. It’s based on what appears to be the I-IV-V chords of a key, and it’s actually one of the most popular chord progressions in all of popular music. The twelve-bar blues chord progression has many variations. Here is one very basic example in A. This example has three parts. The first guitar is playing a typical shuffle rhythm, using 5ths and 6ths, while the second guitar is strumming some 7th and 9th chords on the upbeat. The third part is a walking bass line drawn from the dominant scale of each chord. You can hear and play along with Blues Play-Along Track in A. 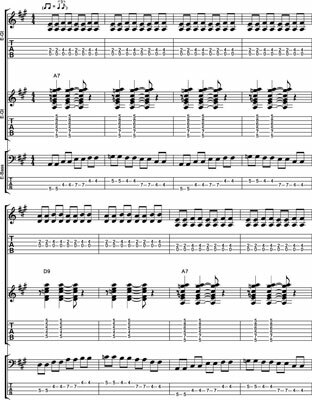 You can see how to play over a 12-bar blues progression in Playing Over a 12-Bar Blues Progression. Blues progressions like the one shown are considered to be I-IV-V progressions. 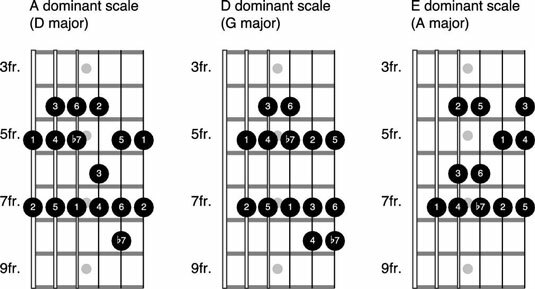 However, only one scale degree produces a dominant 7th chord, and that’s the 5th, V. So because each chord is some form of dominant 7th, each one is actually a V7 chord from a different scale. In other words, blues progressions are really V7-V7-V7, with each V7 chord representing a different parent major scale. A7 is V7 from the D major scale. D7 is V7 from the G major scale. E7 is V7 from the A major scale. You can see these in the bass line. The bass plays the 1st, 3rd, 5th, 6th, and f7th on each chord. These intervals are drawn from each chord’s parent major. You can think of each scale as being Mixolydian since the 5th is the tonic. Because the 5th mode is better known as the dominant scale, the scales used over each chord are A dominant, D dominant, and E dominant. Here’s another thing to consider: Each chord is drawn from a different parent major scale, so each chord change is technically a key change. But because the tonic chord in the whole progression is A, musicians think of everything as being in the key of A, which is why they still count the chords as I-IV-V.
Notice that the key signature is A major throughout and that each chord requires the use of accidentals, except for E7, which is drawn from the A major scale. 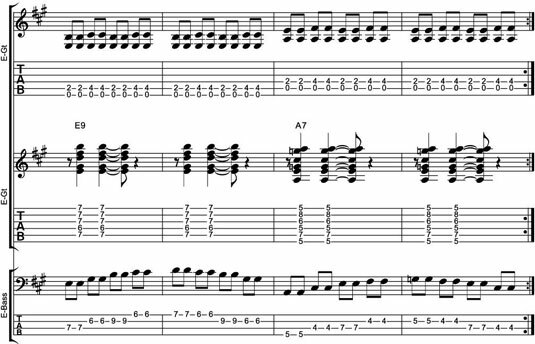 Here are different ways to play the twelve-bar blues progression, using the example shown. As you experiment with these options, remember to walk before you run. Start with an easy option, like sticking with one pentatonic scale over a whole progression, and gradually add on from there as you become more proficient. As you play over these blues changes, you can switch dominant scales as you go. You don’t have to stick to the intervals and patterns that the bass uses. Instead, feel free to play in any position on the neck and use any degrees from the scales. Here is one way to switch scales by staying near the 5th position. Note: The patterns shown here are simply major scale patterns. Just because they are labeled as dominant scales doesn’t mean they’re new patterns. Refer to the parent major scales in parentheses if you need help identifying them. Each pattern starts on the tonic of each dominant scale, but you’re free to play any other notes that belong to the scale, including those that may occur below the tonics. Knowing how to play and switch full dominant scales is important to understanding how a blues progression is put together and how you can approach such a progression as a soloist. However, blues guitarists usually opt for a different and much simpler approach. The preferred scale among blues players is the minor pentatonic, and instead of switching scales, they stick with one minor pentatonic scale over the whole progression. Using minor over major is by far the most common choice among blues soloists, but another option is to play a major pentatonic scale over a whole blues progression. For example, you can use A major pentatonic over everything. The sound isn’t quite as bluesy, but it works. When bluesmen use the major pentatonic, they usually mix it with the minor pentatonic, as you hear in songs like “Johnny B. Goode” by Chuck Berry, “Crossroads” by Cream, and “All Right Now” by Free. Keep in mind that this blues technique is very popular and also applies to other styles of music, especially rock, pop, country, folk, and jazz. Aside from sticking with one pentatonic scale over a whole blues progression, you can also change pentatonic scales on each chord. So in you’d play A pentatonic over A7, D pentatonic over D7, and E pentatonic over E7, with the use of major or minor, or a mix thereof, being your choice. Generally speaking, rock and blues players like to keep things simple and stick with pentatonic scales that correspond only to the tonic chord in a progression. Changing scales over each chord is far more common in country and jazz. However, a good example of a blues-based song that does some switching over chords with major and minor pentatonic scales is “Keep Your Hands to Yourself” by Georgia Satellites.